Vinifiés en fûts. Elevage en fûts 12 mois. “The 2017 Hermitage Blanc is a rocking blend of Marsanne and Roussanne that has classic white fruits, salty minerality, white flowers, and hints of tangerine all soaring from the glass. Rich, medium to fullbodied, concentrated, with good acidity and purity, it’s a classically structured, age-worthy white that does everything right. 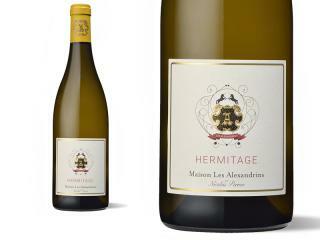 Note that the 2017 Hermitage Blanc Maison Les Alexandrins is a négociant wine. A blend of Marsanne and Roussanne from Maison Blanche and les Roucoules, it boasts ripe aromas of honeyed pineapple. It has a full-bodied, lush and creamy palate rounded out by tropical fruit and a plump, succulent finish. Drink it over the next few years. This is an even split of Marsanne and Roussanne from the Maison Blanche and Roucoules plots on the high eastern side of Hermitage – a good blend as they have quite different characters. These are both grapes that will have suffered less in the heat than the Viognier, but you still feel the rich roundness of the fruit. It has that lovely touch of bitterness on the finish that is so typical of Hermitage Blanc, a dot of spice and saffron enclosing the citrus. It’s gourmet and enticing, with salty toasted almonds bringing up the rear. Extremely mouthwatering, this begs to be drunk while enjoying tapas with friends. 12 months ageing in barrel, no need to rush this.